Gauteng MEC for Sports and Recreation Faith Mazibuko (file photo). 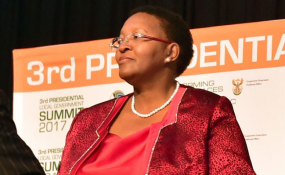 Gauteng MEC for Sports and Recreation Faith Mazibuko has promised to subject herself to the ANC Integrity Commission for her rant, which was captured in an audio clip that went viral. In the clip, a furious-sounding Mazibuko can be heard demanding that planned "combi courts" which can be used for a variety of sporting codes, would help bring the ANC votes in the May 8 polls. During her tirade, she chastised two senior staffers - believed to be an Indian woman and a white woman - for talking back to her. "That's why some departments, they don't want to see a white woman or any Indian woman! It's not about racism. It's because you like talking English!" Speaking to News24 during the official handover of the newly built combi court in Evaton in the Vaal on Friday, Mazibuko said she would follow all disciplinary processes instituted against her. "I am willing to go through the disciplinary process of my political party anytime when called. I respect the ANC with all my heart and will abide by its rule. "I have told my leaders that should I be called to the Integrity Commission, I will fully comply," she said. Mazibuko added that she intended to respect any decision taken against her. "I love this organisation. It has made me who I am. I am a human being who works with human beings and make mistakes like everybody else. "I have apologised to my colleagues, my family, my organisation and everyone that I have hurt with my utterances. I am still apologising from the bottom of my heart. As a mother and leader of the ANC Women's League, I am again saying that I am sorry for what had happened," she said. Mazibuko is the chairperson of the ANC Women's League in Gauteng. Last week, the league issued a statement apologising to fellow women. Mazibuko is known for her jokes, township lingo and laughter. Last week, Gauteng Premier David Makhura said he had spoken to Mazibuko about her rant and reprimanded her. "The utterances of the MEC Faith Mazibuko toward the head of department and chief financial officer are totally unacceptable and inconsistent with what I expect from MECs," said Makhura.